Polo came to America at the turn of the 20th century and the sport a millennia years old took root in America. In the west it first became popular in the San Diego area where it was played on Coronado Island. The desert became a popular destination for many famous Hollywood celebrities and others beginning 20 years earlier when known to only a few that La Quinta had become popular in it's own right. By the early 1950's Polo in Palm Springs had begun to attract the interest of Polo players from around the country. President Dwight D. Eisenhower, with whom my mother and I had the honor and pleasure of sharing a moment with him and Mrs. Eisenhower in his limousine, truly brought fame and attention to the desert. The original fields were located much closer to Palm Springs near the location of today's Palm Springs International Airport. Then, because of urban sprawl and rising property values the Club was forced to move and the next stop was Palm Desert and from there to it's third and present location in La Quinta where I visited for the second time. Once again because of the hunger for development and the same rising property values surrounding the Palm Desert location, now the Vintage Club, had happened twice before as is typical for any activity which requires a large amount of land and attracts a lot of people and interest. The occasion of my visit was the 1986 U.S. Open Polo Tournament hosted by the Prince of Wales, Prince Charles who attended the festivities, played valiantly and hosted a magnificent gala as a tribute to the progress of the Eldorado Polo Club as well as the U.S. Open as he did several times thereafter. More recently Prince Harry, Harry Wales as he's known to his Special Forces comrades in the Royal Maines and third in line to the throne of England, hosted and played in a charity tournament at the Club. The Club plays host to many additional charities not the least of which is the College of the Desert located in Palm Desert for which the Club raises tens of thousands of dollars annually. Perhaps the most well know of these charities is the Barbara Sinatra Skins Polo Game which supports charities for neglected and abused children. My most recent visit to the polo fields, which incidentally is a mere two hour drive from Los Angeles and a half hour from Palm Springs, was an eye opener. On my first visit to the Club as a child there were only two playing fields and a few players. Now, as the nations winter capital of polo, due significantly to the weather there are twelve fields, ten owned by the Club and two leased from the nearby Empire Polo Club, and during my visit there were twenty-nine teams playing consecutively in three formats, low score, medium and high scoring events with an eclectic groups of players, it's truly a "players" club, as it was from the beginning and includes all members of the family including children. All in all my recent visit to the California desert reinforced my interest, appreciation and love of the "paradise in the desert" and I know you will as well whether playing or watching. College students who like to play fun board games often enjoy the style of board game sometimes called the Eurogame, or German style or designer board game. A Eurogame is not necessarily from Europe though many have originated in Germany. The term Eurogame generally refers to a genre of board games that share similar characteristics. Player conflict and competition is not often head-to-head as in a war game. Instead it involves gaining resources and accumulating victory points. Players are rarely eliminated part of the way through the game, as they are in Monopoly. The winner is often unknown until the very end of the game when scores are calculated. If there is any randomness, such as that introduced by dice, it can be offset by other facets of the game including the player's skill. The game's artwork and components are chiefly cardboard and wood and are often quite lavish and detailed. There is a theme to the board game, such as life in a Medieval castle or maneuvering through a desert, but said theme seldom has much to do with actually playing the game. When it does, players consider it a real bonus. Eurogames are often closely connected to their designers, several of whom are very well-known in gaming circles. Of particular note are Reiner Knizia, Wolfgang Kramer, Uwe Rosenberg, Klaus Teuber, and Bruno Faidutti. Fun board games by these men are among the most highly rated in the 1990's and 2000's. 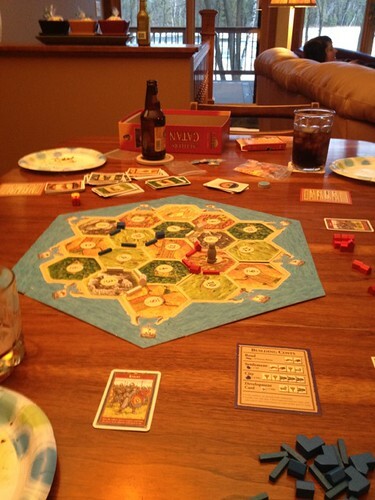 Possibly the most well-known Eurogame to date is The Settlers of Catan created by Klaus Teuber. Using a game board that changes from game to game, resource cards - wood, brick, sheep, grain, and stone - and a single die, you build roads, cities, and settlements to earn victory points. Do so more quickly and efficiently than your opponents and you're likely to win. Puerto Rico is one of the most highly-ranked games of all time. You play the role of a plantation owner on the island of Puerto Rico. Grow your crops - corn, indigo, sugar, tobacco, and coffee - build your business, and ship your products while paying close attention to what your opponents are up to. Carcassonne is a very popular tile-laying Eurogame that uses meeples. Meeples are little wooden game bits that vaguely resemble tiny people. They are placed on tiles to indicate ownership of roads, cities, and fields. Finish off roads and cities to score points and reclaim your meeples for reuse on more construction projects. El Grande is the grandfather of all area control Eurogames. Deploy your caballeros (wooden cubes) in the regions of old Spain to maintain a majority rule so that when one of the 3 scoring rounds comes, you get more points than your opponents. Wise use of power cards, which determine turn order, and careful choice of action cards, which determine caballero placement (among other interesting things), are key to winning this fun board game. Agricola, by Uwe Rosenberg, is a game about farming. You don't have to know anything about farming to play this fun Eurogame however. This is a worker placement game in which you start with a farmer and his wife in a 2-room wooden hovel. You job is to improve your farm and its pastures and fields. Hundreds of improvement and farmhand (loosely speaking) cards aide you over 14 rounds. Welcome to the College of the Desert. College of the Desert provides excellent educational programs and services that contribute to the success of the students.